These days most cars come with a carbon emissions rating. This rating tells us the emissions generated per kilometre or mile of driving a car, and helps us to compare the climate impact of different cars. Although this a good way to compare vehicles, it isn’t very useful for understanding your real life driving emissions. Like official fuel economy estimates, these ratings can be quite different from reality. In this post we will show you how to calculate a more accurate estimate of your driving emissions. This estimate will be based on your actual fuel economy and include the impact of vehicle manufacturing, fuel combustion and fuel production emissions. Although it is easy to find the official carbon emissions rating of your car, this figure isn’t very useful for understanding your real driving emissions. Vehicle emissions need to be tested in a standardized and controlled way, so test cycles are used to give an official carbon emissions rating to a car. Although this allows for fair comparison between vehicles, real life driving often bares little resemblance to the test cycles. Furthermore, these ratings only allow for fuel combustion emissions, thus forgetting to account for the impact of fuel production and vehicle manufacturing emissions. In order to calculate your actual driving emissions it helps to estimate the fuel economy, or fuel consumption, you actually get from your car. Many modern cars will calculate this number for you, giving you an instantaneous figure or the average over a trip. Even if you do have an on-board computer that tells you these figures, it is useful to work it out for yourself over a few tanks of fuel to ensure it is accurate. To do so simply fill your car to full, and make a note of your car’s mileage. At each of the following refuelings fill the car up again then note the mileage and fuel you put in the tank. After a few tanks full you will be able to work out your fuel economy or fuel consumption by dividing total mileage by fuel used. Depending on where you live your fuel economy will be measured in terms of MPG (US), L/100km, km/L or MPG (UK). Once you have this estimate you can make an accurate calculation of your driving emissions. The next four sections explain how to estimate driving emissions using MPG (US), L/100km, km/L and MPG (UK). In the US fuel economy is measured in miles per US gallon. If you know what fuel economy you get then you can quite accurately calculate your driving emissions per mile, and your total driving footprint. For a rough estimate you can use the following chart, which shows typical driving emissions based on fuel economy. From this chart your can see the driving emissions of gasoline vehicles are dominated by fuel combustion emissions. Total driving emissions rise from 226 g CO2e/mile when achieving 60 MPG (US) to 575 g CO2e/mile for 20 MPG (US). If you want to be more accurate than these estimates you can do your own calculation. Manufacturing emissions are assumed to be a constant figure of 32 g CO2e/km (51 g CO2e/mile) for all of this post. This is based on a manufacturing footprint of 8 t CO2e per vehicle and average lifetime mileage of 155,000 miles (250,000 km). Manufacturing emissions can vary considerably depending on materials, vehicle size, production techniques, vehicle technology and lifetime mileage. If you have more specific data on your own car you will be able to improve this estimate. Fuel combustion emissions can be calculated from an actual fuel economy, as we know around 8.8 kg CO2e is produced using each US gallon of fuel. So if you know your car averages 25 MPG then you can divide 8.8 by 25 to give 351 g CO2e/mile for fuel combustion emissions. Fuel production emissions can also be calculated using an emissions factor. Although this varies depending on the type and location of the oil, we know for conventional gasoline around 1.64 kg CO2e/US gallon is emitted during oil extraction, refinement and transportation. In places like Europe, China and Australia fuel consumption is measured in terms of litres used per one hundred kilometres travelled. If you have worked out your own fuel consumption in terms of L/100km you can use this to calculate your driving emissions. For a simple and quick estimate use the following chart, which shows typical driving emissions based on fuel consumption. Total driving emissions rise from 143 g CO2e/km at a fuel consumption of 4 L/100km to 364 g CO2e/km for 12 L/100km. If you want to be more accurate than these estimates you can do your own calculation. Manufacturing emissions are again assumed to be 32 g CO2e/km, based on a manufacturing footprint of 8 t CO2e per vehicle and lifetime of 250,000 km. If you have more specific data on your own car you will be able to improve this estimate. Fuel combustion emissions can be calculated using the emissions factor of 2.33 kg CO2e/litre. If your car average 8 L/100 km then you multiply this by 2.33 and divide by 100 to give 186 g CO2e/km for combustion emissions. Fuel production emissions can be calculated using an emissions factor of 0.43 kg CO2e/litre. For 8 L/100 km you would multiply by o.43 and divide by 100 to give 34 g CO2e/km. Fuel economy is measured in kilometres per litre (km/L) in many places including Japan, India, South America and parts of Africa. If you have worked out your own fuel economy in terms of km/L you can use it to calculate your driving emissions. For a simple and quick estimate use the following chart, which shows typical driving emissions based on fuel economy in km/L. Total driving emissions rise from 147 g CO2e/km when getting 24 km/L to 378 g CO2e/km for 8 km/L. If you want to be more accurate than these estimates you can do your own calculation. Manufacturing emissions are assumed to be 32 g CO2e/km based on a manufacturing footprint of 8 t CO2e per vehicle and average vehicle lifetime of 250,000 km. If you have more specific data on your own car you will be able to improve this estimate. Fuel combustion emissions can again be calculated using the emissions factor of 2.33 kg CO2e/litre. 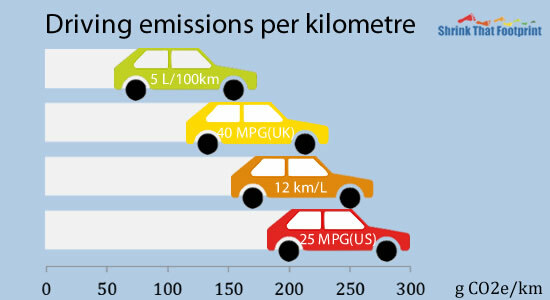 If your car averages 14 km/L then you divide 2.33 by 14 to give 166 g CO2e/km for combustion emissions. Fuel production emissions can calculated using an emissions factor of 0.41 kg CO2e/litre. For 14 km/L you would divide 0.43 by 14 to give 31 g CO2e/km. In the UK fuel economy is measured in miles per imperial gallon, MPG (UK). This imperial gallon should not be confused with the US gallon, as it is 20% larger. If you know the fuel economy you get in MPG (UK), then you can calculate your driving emissions. As we can see from the chart total driving emissions rise from 231 g CO2e/mile driving at 70 MPG (UK) to 554 g CO2e/mile for 25 MPG (UK). If you want to be more accurate than these estimates you can do your own calculation. Manufacturing emissions are assumed to be 51 g CO2e/mile. This is based on a manufacturing footprint of 8 t CO2e per vehicle and average lifetime mileage of 155,000 miles. If you have more specific data on your own car you will be able to improve this estimate. Fuel combustion emissions can be calculated from an actual fuel economy, as we know around 10.6 kg CO2e are produced using each imperial gallon of petrol. So if you know your car averages 30 MPG then you can divide 10.6 by 30 to give 353 g CO2e/mile for fuel combustion emissions. In this post we have seen how you can use a simple method to accurately calculate your driving emissions from actual fuel economy, together with an estimate of your vehicle’s manufacturing emissions. This figure represents the average driving emissions from your vehicle. It can be used to understand your driving footprint, and plan ways to reducing. How much heating energy do you use?